We are Grazi, Elizabeth, Edalina, and Karolina and we are team GEEKsystem of From the Top’s Center for the Development of Arts Leaders. 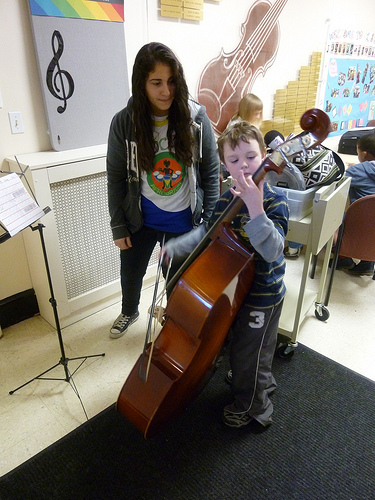 We are working with the Conservatory Lab Charter School in Brighton, MA a pre-K-6 public charter school that has fully incorporated the inspiring El Sistema music program model, allowing for almost 3 hours of daily music instruction for every one of its students. 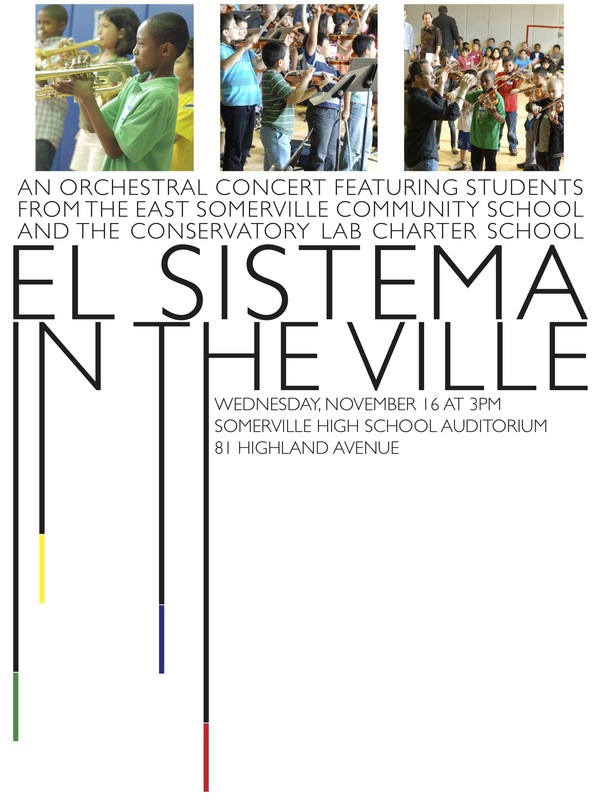 As a team, we have two goals: to raise awareness of El Sistema in the Boston area and to help lay the foundation for a similar program at the East Somerville Community School. To do this, we have organized a concert that will take place on November 16th at the Somerville High School auditorium at 3pm. “El Sistema in the Ville” is meant to bring together kids from both schools to play music and to highlight the importance of support for music education. Read the press release. Currently, El Sistema Boston is limited to the Conservatory Lab Charter School. 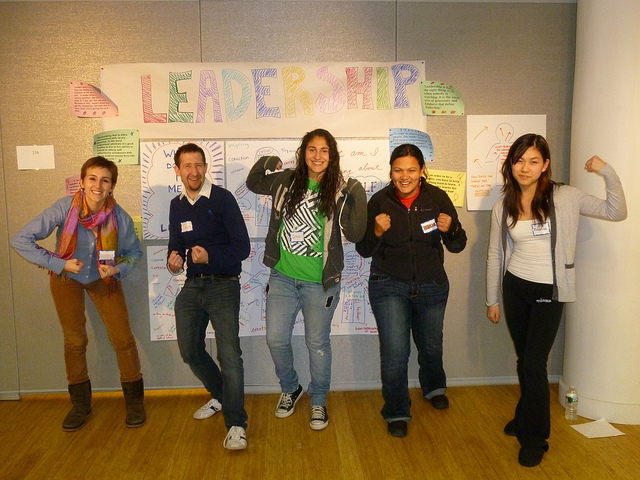 The program is focused on creating social change by nurturing a passion for music and excellence in each student. 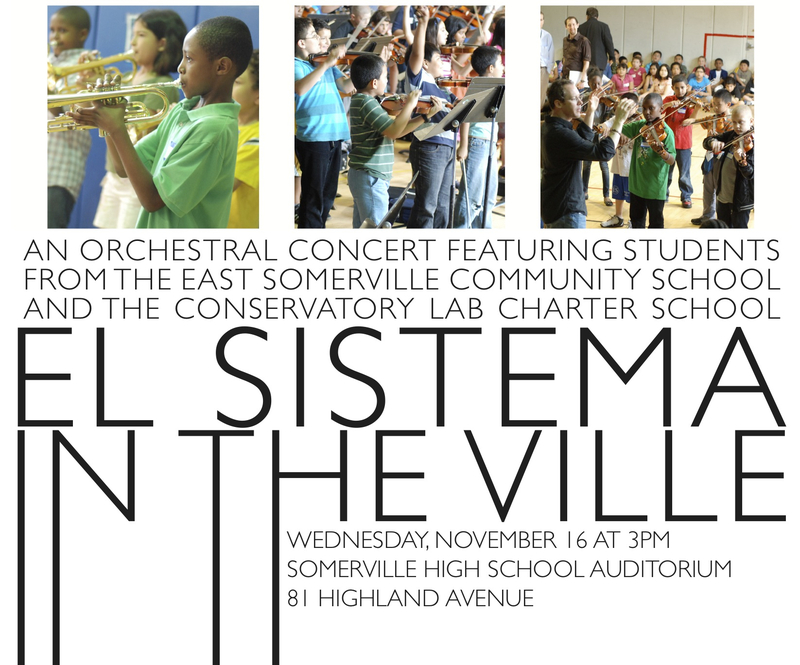 Imagine how many kids could benefit from this if the El Sistema model was brought to other schools in Greater Boston! Community support is crucial for the success of concert, and the El Sistema initiative in general! GEEKsystem spent the spring getting to know and understand the program and it has been so inspiring to watch the passion in each student grow every day. We want every kid to share in this life changing experience! How can you help? Come to the concert and be a part of this experience! If not, spread the word about the concert and about this initiative by sharing our Facebook event.